We are nearing the summer months. School is winding down, the weather is getting warmer and the days longer. So what could be better than a little slice of summertime dessert. This tart just speaks summertime to me. It is light and full of lemon flavor. And of course anything topped off with fresh berries is summertime worthy. And this lemon curd is perfect for this Lemon Marshmallow Tart. Preheat the oven to 350. In a bowl, mix together the graham cracker crumbs, sugar and butter. Press into an 11-inch tart pan with removable bottom. Bake in the preheated oven for 6-8 minutes, or until golden brown. Remove and cool completely. When the crust is cool, combine the lemon curd and the marshmallow creme in a bowl. Whisk until smooth. (It will come together, just keep at it-think of it as a great arm workout.) Pour into the cooled crust, and refrigerate until set up, at least a couple of hours. 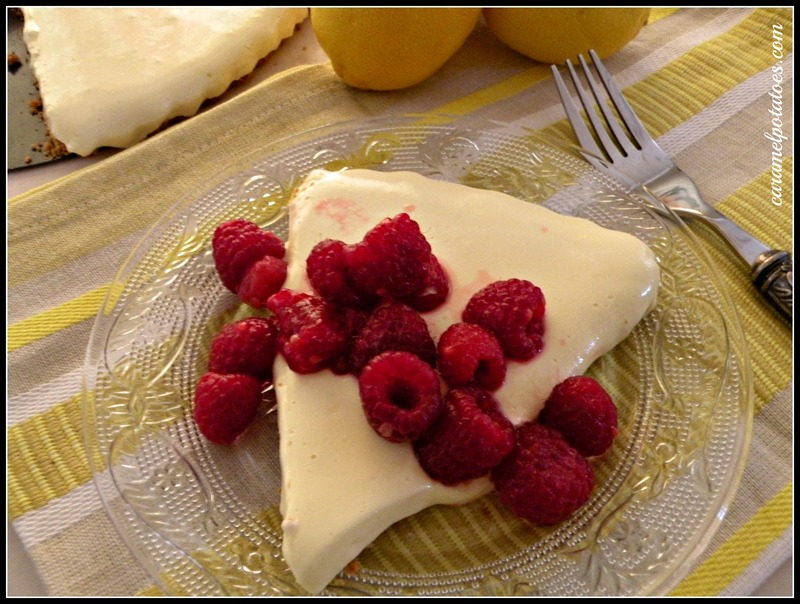 Serve with raspberries or diced strawberries. We tried this over the weekend and it was amazing!! Thanks-can’t wait to make it again. Ooooo-this looks to die for. I love anything with lemon flavor and the idea of marshmallow in it sounds so good.